Cascade Avenue between Colorado and Platte avenues is one of several Downtown roadway projects to be completed in 2017 as part of the “Link the Loop” project. This project, combined with others will be implemented over the coming months and years, will provide a network of safe multi-modal connections to the Downtown core from the Legacy Loop trail system. No change in travel lanes maintaining current traffic volume and accessibility to I-25. Platte Ave. to Bijou St. Remove 5 on-street parking spots on northbound Cascade Ave.
Current dual right turn lane onto Bijou Street will change to a single right turn lane. Southbound Bijou St. to Kiowa Ave.
Colorado Ave. to Pikes Peak Ave.
Northbound Kiowa St. to Bijou St. 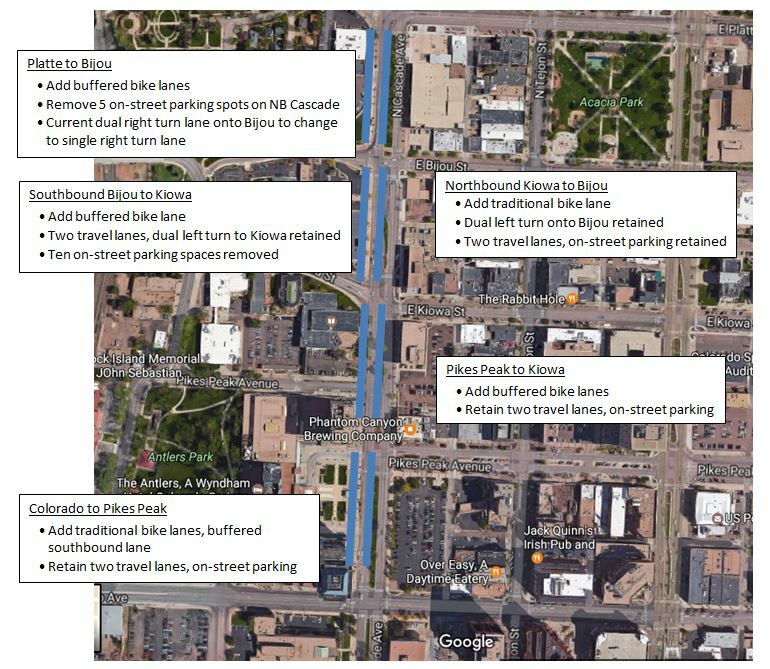 Retain dual left turn lanes onto Bijou St.
Pikes Peak Ave. to Kiowa St. This is a well-used corridor by pedestrians, cyclists, and drivers; the street redesign and improvements to traffic control will create safer conditions for all users. The addition of new on-street cycling facilities will provide better connectivity to a density of office space as well as stores and restaurants, supporting those who choose to commute by bicycle and businesses that will benefit from easier access by bike. The project provides an on-street trail extension from the Legacy Loop trail system, providing trail users with improved access to the Downtown core from the Shooks Run trail on the east side of Downtown, to eventually connect with the Pikes Peak Greenway on the west side of Downtown. Public input for the master plan included 18 months of public/stakeholders to be engaged with the plan and provide input, seven months to provide comment on the draft, approximately 20 public meetings to attend and provide comments verbally, as well as the public community forum and online engagement via the DowntownCS.com website. 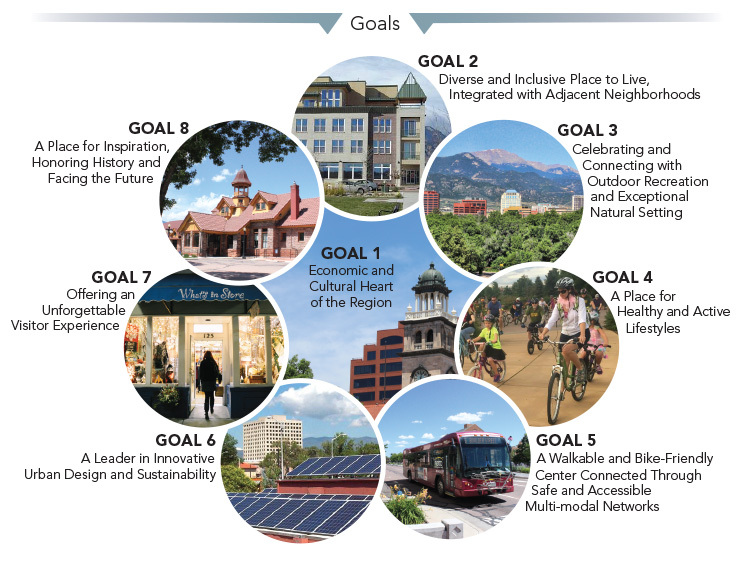 As well, these were merely updates to the Imagine Downtown plan, which had well over 400 stakeholders involved over a multi-year planning process. Two public meetings were held in February 2017 to outline the first phase of roadway projects, including Cascade, which are all planned for completion by the end of 2017.